We enjoy doing things differently and that’s why we are the only Hot Air Balloon company in the world that gives you the chance to fly with falcons. 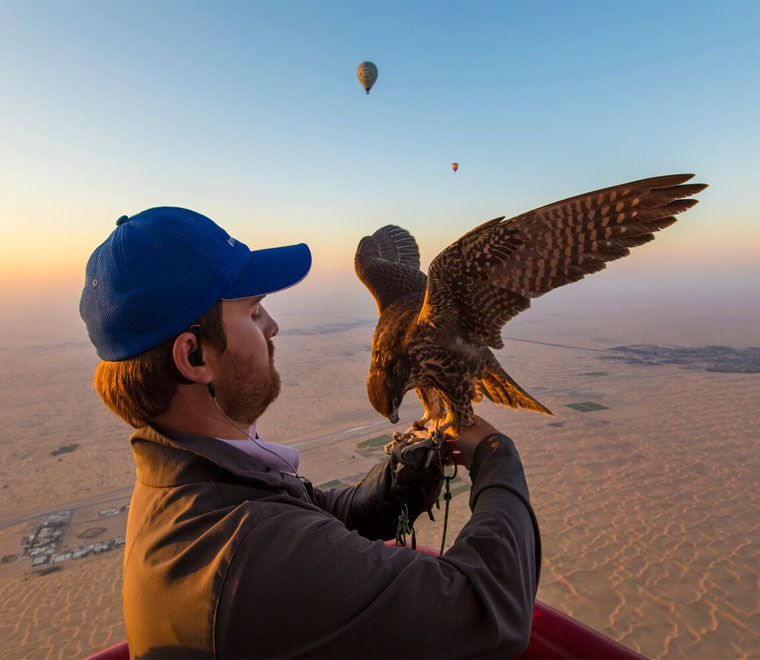 We invented this innovative and unforgettable experience which combines falconry and ballooning in a truly unique manner. Our falcons were especially bred in Scotland and extensively trained in Italy before arriving in Dubai to become the pioneers of sharing the skies (and baskets) with our lucky Guests. 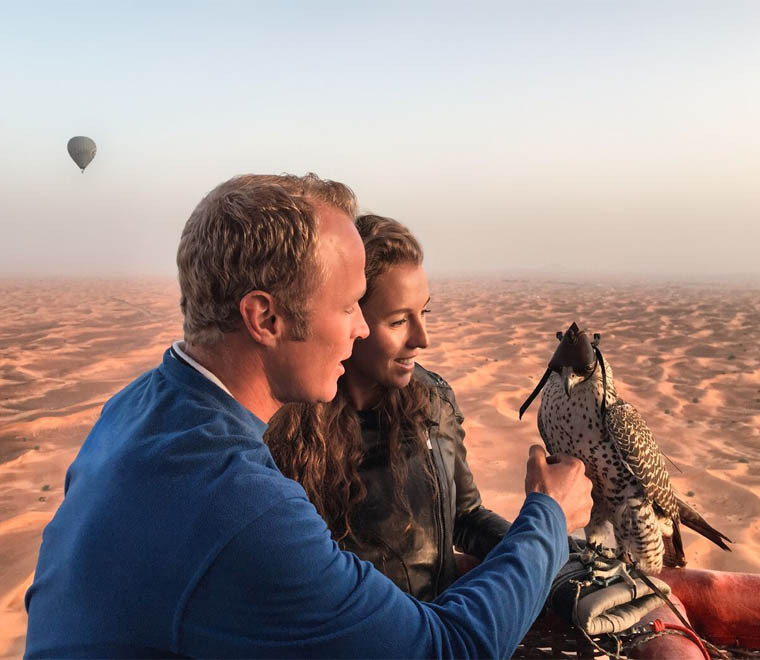 Watching the Arabian sunrise over the desert as a falcon is released at 4000ft from the basket to soar around the hot air balloon is a breath-taking experience like none other! As the pioneers for hot air ballooning in Dubai in 2005, with the most experienced Pilots in the world, we are the experts in creating the best ballooning adventures! Our team of experienced Pilots are highly trained and understand the local weather conditions ensuring the best and safest flights in Dubai. As the longest operating Hot Air Balloon company in Dubai, and after 13 years and thousands of flights, we are still setting the standards for everyone to follow. There are some things in life that you don’t want go cheap on: Doctors, Dentists and Pilots. 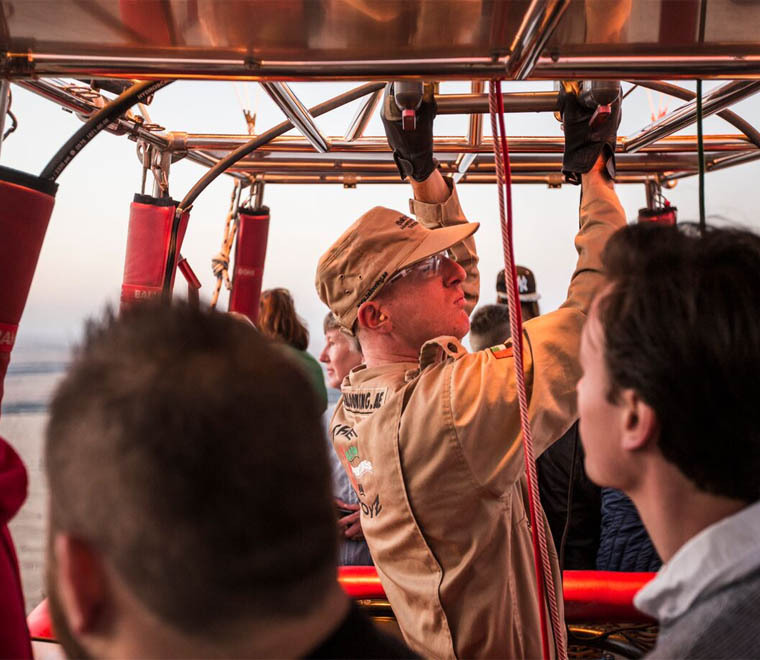 Although hot air ballooning is a truly impressive experience, we decided to take it to the next level. We like to think we give you the complete ‘wow’ experience (and don’t just claim to!). 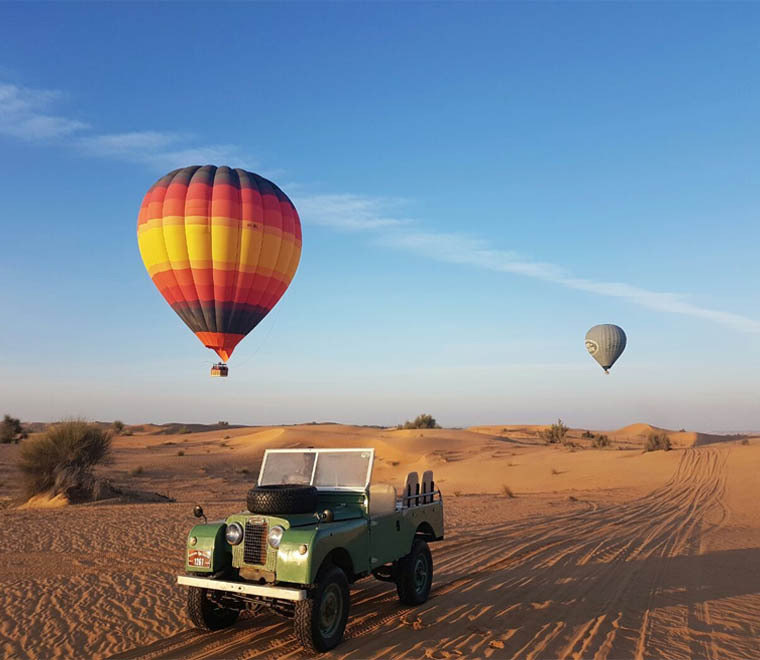 After your amazing hot air balloon flight, ride in 1950’s vintage Land Rovers to an authentic Bedouin camp nestled in a Royal desert retreat. Instead of a dry sandwich in the back of the car (other balloon companies), enjoy a delicious buffet breakfast complete with caviar, smoked salmon and perfectly cooked eggs in a magical setting in the desert before returning to Dubai with your appetite for adventure (and breakfast) fully satisfied! Our World records and the range of awards sitting in our trophy cabinet are testament to our efforts and successes as the leading Hot Air Balloon Company in the UAE. As an ambitious company, we only partner with the best: Platinum Heritage and Royal Shaheen Falconers to bring you the ultimate hot air ballooning experience.